Gamorreans were a sentient species of green-skinned porcine humanoids that hailed from the Outer Rim planet of Gamorr. They grouped themselves in clans, each of which was led by a warlord and a Clan Matron. A number of Gamorrean guards were employed by the crime lord Jabba the Hutt throughout his career. A species of tall, strong bipeds, the Gamorrean’s had porcine traits, like an upturned, large-nostriled cartilaginous snout, jowls, and upturned tusks. Their hulking bodies were covered in green, thick and hairless skin. They had five digits on every extremity, each sporting a hard nail. The digits of their hands included an opposable thumb, which allowed the Gamorrean’s to easily grasp and handle objects. The species had two sexes: the males, referred to as boars, and the females, called sows. Gamorrean’s had a clan-based society. Each clan was ruled by a female leader, the Clan Matron, and a male leader, the Warlord. Although the sows farmed and hunted while the boars waged wars, the Gamorrean society was in fact a matriarchy. Indeed, a Warlord held his position by way of marriage to a Matron rather than force, although Matrons did make their selections based on the boars’ combat skills. Gamorrean’s saw war as glorious, and violent clashes between clans were rife. Because of their low intelligence, Gamorrean’s tended to be both stubborn and loyal; philosophically, they believed that any problem could be solved by hitting it with brute force. They had a language of their own that sounded like mere grunts and squeals to outsiders. Although they could understand other languages, such as Galactic Basic, they found most of them too difficult to pronounce. Technologically speaking, the Gamorrean’s were primitive, and they favoured melee weapons like vibro-axes and vibro-lances over blasters. They never discovered space travel on their own. Moreover, Gamorrean boars failed to maintain personal hygiene, rarely changing their clothes or wiping the streaming mucus from under their snouts. It wasn’t a job! It was an adventure! Your path to playing the Gamorrean Guard is quite unique, how would you describe the transition from music to acting? The transition came naturally because I’ve always been involved with film through music! What was it like working with your close friend Corey Dee Williams in Star Wars? That was the best part about it. We were able to keep creating and playing music on location for the cast and crew and share that experience together! 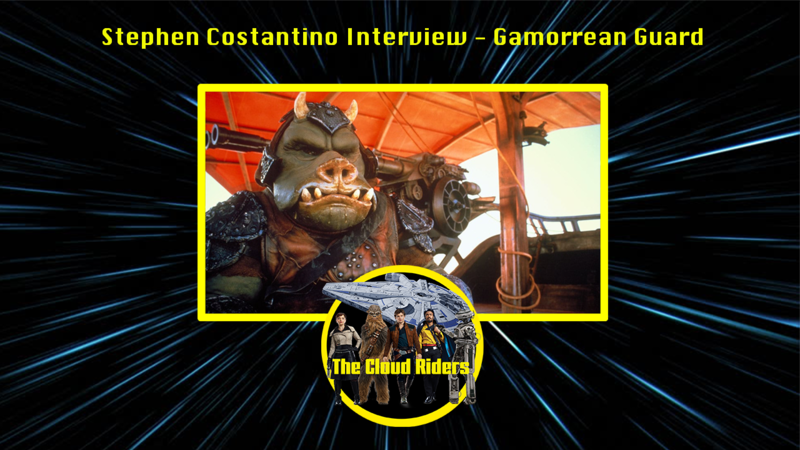 Playing the Gamorrean guard and hearing all the great stories from the extraordinary cast and crew was an inspiration! Star Wars is something I could never imagine being such a big part of my life! Do you attend many comic conventions, if so, what does fan interaction mean to you, and do you have any appearances coming up? I do quite a lot of conventions and love meeting all the fans! It’s always exciting to go to a new place in the Star Wars universe! You never know who you’ll meet or what experiences you might have! I think my next show is in Vegas. I’ll keep you posted! The Gamorrean Guards were involved in one of the greatest movie scenes of all time, the Jabba’s palace/sail barge scene. What was this experience like? I couldn’t see much except what was in front of me and the footsteps they mapped out for me to follow. It was incredibly hot but I loved every minute of it never realising that I was in the most pivotal seen in the movie being sent into the sarlacc pit by Luke Skywalker until years later! I don’t quite remember but I know when the top half was off it was hard to stand and Corey had to hold me up! What are some of your favourite characters and scenes from the Star Wars franchise, and why? I always loved Yoda and the incredible story that Stuart Freeborn shared with us as one of the creators! One of my earliest memories of Star Wars was owning a Gamorrean Guard figure when I was around 5 years old, it was one of my favourites and I used to carry it everywhere I went. What were your thoughts when you found out there were figures of your character? It’s still unbelievable that I’m a Star Wars and Disney figure! It’s become my trademark!